When you make your home at Springs at Creekside, you can take advantage of our long list of convenient community features. Let us show you how great life can be. Imagine waking up on a warm Friday morning in your open and light-filled apartment home. You slip on your sneakers and grab your gym bag from your spacious walk-in closet. Then you jumpstart your day on the cardio equipment in our state-of-the-art 24-hour fitness center. After your workout, stop by the free coffee bar for a caffeine boost. Plus, with free WiFi in the clubhouse, you can check your email to get a head start on your day while you enjoy your complimentary coffee. After a shower and a wardrobe change, you pick up your car from your attached or detached garage option and leave our gated community for your quick commute to work. 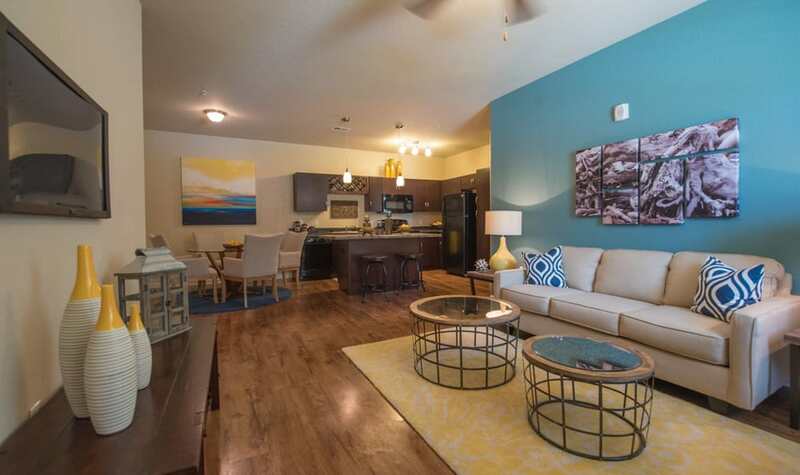 To explore the deluxe interior and community amenities at Springs at Creekside, contact our leasing team to schedule your tour of our apartments for rent in New Braunfels, TX.